If you’re thinking of switching your TV and broadband service this Christmas then this new deal from the folk at Virgin Media is worth checking out. It includes a free £75 Amazon Gift Card, which you can spend on the family or treat yourself to something. 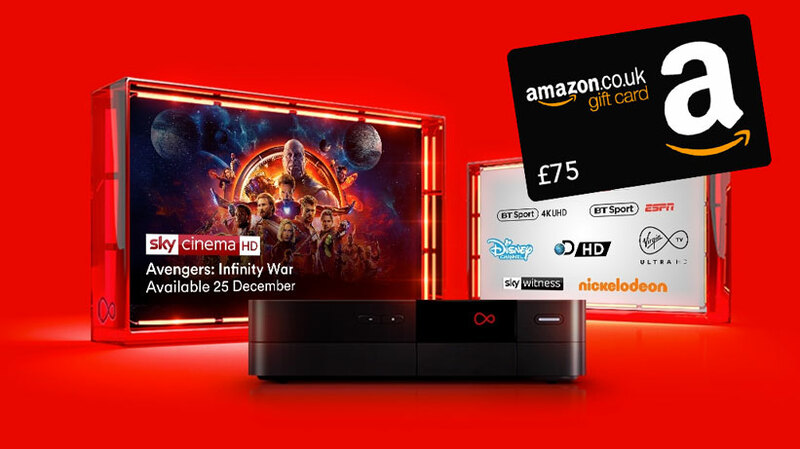 The broadband included is Virgin’s Vivid 200 package which is is ideal for busy households with 10 or more devices connect to the internet – those smart TVs, mobile phones, games consoles and speakers all soon add up. The Virgin TV V6 box is their latest box which let’s you record up to 6 shows at once, while you watch a 7th. It includes a whopping 1TB of storage which can store up to 100 hours of HD TV (or 500 in Standard Definition). It’s a 12 month contract, with a £25 set up fee and then costs £67 per month. That includes your TV, broadband and landline. You can keep your existing phone number and Virgin will get in touch with your current landline provider to make the switch. The offer ends on December 23rd 2018 so be quick if you want to grab it. Do I need to give notice to my current provider? Yes, so they don’t keep billing you! Once you have an install date from Virgin, give your old provider a quick call to let them know you want to cancel your services. Most ask for 14 to 31 days’ notice, so Virgin should be able to get you connected before your old services are switched off. Do Virgin install all the services at the same time? Yes. Because Virgin own their entire network – unlike some other providers – they’re able to get all your services up and running on the same day. To get this deal just follow this link, just remember it ends on December 23rd.